Especially during this time of year, we often think of those that are less fortunate than ourselves and we look to assist in ways that we are able to. Perhaps we donate to our local food pantry or volunteer at the local soup kitchen or maybe assist with meal preparation through our church. These are noble acts of kindness and generosity, but today we turn our attention to our feathered friends outdoors and provide you with some tips to keep them going strong throughout the winter. While there are a number of birds that make their way south for the winter, there are also plenty that stay put to weather out the winter elements with the rest of us. Finding food this time of year can present a challenge to birds due to the snow and ice that often covers the land. 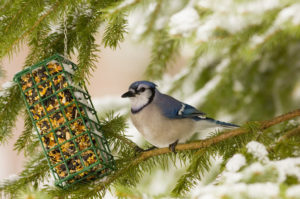 With some planning and a few simple steps however, you can do your part to help keep birds well fed during the winter. Our first suggestion for winter feeding months is to invest in a large capacity feeder. Providing a larger feeder means fewer trips outside to refill it for you and less of a chance that the birds in your backyard will have to go without. The placement of your feeder is also important because you want to ensure that it is located somewhere that will allow your visitors some protection from the elements. At the same time is should also be a priority to keep it safe from predators and thieves (such as squirrels). Additionally, most people that utilize bird feeders also want to watch the birds so a location that is visible from inside is also nice. However, if you can only have two of the three, we recommend protecting the birds from the elements and the thieves. When it comes to selecting a food for the winter months, it is important to take into consideration that it is much more difficult for birds to find fresh fruit and insects in the winter months. Consequently, choosing a seed that provides a higher fat or oil content, for example black oil sunflower seed or white millet seed, will ensure that the birds have the energy supply they need to survive and thrive during the winter months. This is especially important if there comes a period of time when the feeder sits empty for a day or two. Our final suggestion (although there are certainly other steps you could take to ensure bird survival as well) is to provide a heated birdbath. Regular access to water to stay hydrated and clean is important for birds, as clean feathers allow birds to be better insulated and maintain their body temperature. Even if you cannot maintain the birdbath everyday, offering it once or twice a week will be a welcome opportunity for birds to partake in some self-care. At Charlie Johns we offer everything that you need to ensure your feathered friends are well cared for this winter. Stop in and we’ll be happy to offer our expertise.